The fourteen sermons contained in Saved By Grace Alone were preached in Westminster Chapel, London, on Sunday evenings between 15 April and 15 July 1956. They are a fine example of preaching evangelistically from a consecutive passage of the Old Testament. While they are firmly based on the meaning of the Scripture text in its original setting, they are not overloaded with historical or exegetical detail. The larger themes of Ezekiel's message to the people of his own day are kept prominently in view. Dr Martyn Lloyd-Jones was a preacher who focused on the unchanging, recurring needs of human beings and the everlasting good news of God's grace. He dealt plainly with the reality of sin as disobedience to God's law, but he also exulted in the tenderness and abundance of God's salvation through the life, death, and resurrection of Jesus Christ, the incarnate Son of God. It was his emphasis on this crucially important gospel truth-that we are 'saved by grace alone'- which made his preaching, and these sermons on Ezekiel 36, truly timeless. 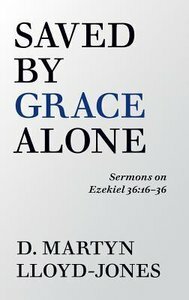 About "Saved By Grace Alone: Sermons on Ezekiel 36:16-36"